I have always been an art forgery enthusiast. No, enthusiast isn’t really the right word for it. I have studied the histories of art forgers the way I study pirates: I occasionally like to revel in the romanticism of the underdog, but at the end of the day I know they are just vengeful brigands wielding cutlasses (or paintbrushes) and wreaking havoc wherever they go. Some art professionals consider art forgeries a valuable asset in forcing buyers and sellers alike to pay closer attention to the quality of a work, while others look at them merely as the cost of doing business. However, there is a great deal of difference between forging paintings and forging provenance, for when you tamper with the documentation surrounding a work of art, you compromise not only its historical integrity, but that of any other painting, collector or gallery affiliated in any way with the damaged documentation. This is a far more intolerable crime. Imagine if you will, one man gaining access to the archives of the Tate Gallery, and, posing as a friend and benefactor of the correct archiving of Britain’s modern art, willfully forging provenances and receipts and catalogues, and implicating, not only the Tate Gallery, but the V&A and even a priory of monks. Imagine the amount of damage he could have done, using forged paintings and matching them with forged documentation that could then be corroborated by real academic institutions. Unfortunately for you and me, we do not need to imagine it, for this actually did happen, 15 years ago: the con man was John Drewe, and the forger was John Myatt. 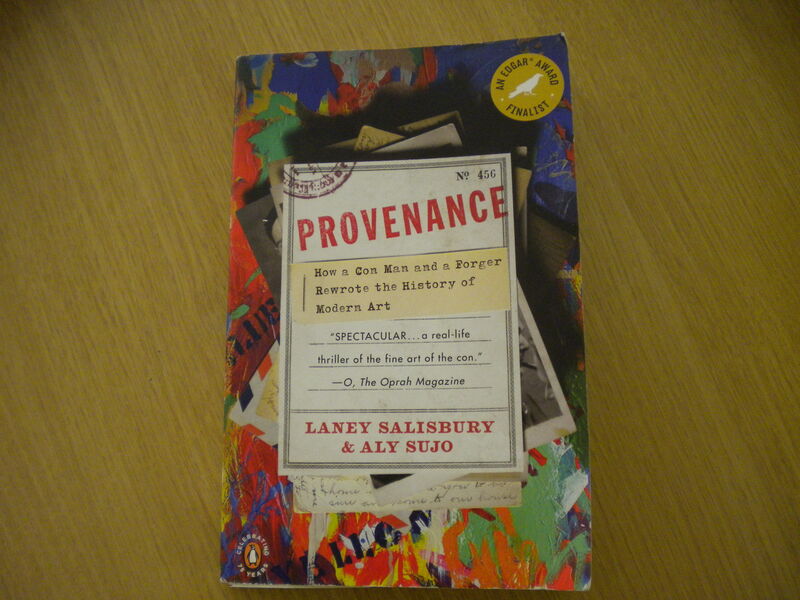 In Provenance: How a Con Man and a Forger Rewrote the History of Art, Salisbury and Sujo have brilliantly chronicled Drewe’s scheme to use phony documentation to authenticate Myatt’s forgeries, and how they managed to elude the authorities for nearly a decade. They not only recount the story, but in such a way as to even leave the reader in the dark until the right moment, deftly interweaving narrative and quotes to form a rich and dense fabric of intrigue, deception, and art. I am not exaggerating when I tell you that several times it left it on the edge of my seat, and yet the conclusion was wholly satisfying. I think this book would appeal to art and true crime enthusiasts alike, and I cannot encourage you enough to go out and read it right now!